Since I started blogging here on the interwebz, I have struggled with the desire to say what I want, when I want and still maintain my privacy and some sense of anonymity. Sounds strange I know. However, a good writer has to sometimes set their other half free, otherwise you just become some chick with a marketing blog, right? Right, so this morning I was thinking about what I believe to be true (not what some unknown “they” tells me is true) and good and right; and why it is that I think we the people have strayed off the reservation so to speak. I believe that life is more about the journey than it is about the destination and you absolutely have to live in the “NOW”. If you are the one sitting in the backseat impatiently asking “Are we there yet?” then please let me remind you that the only “there” involves a box and a hole in the ground (or ashes in an urn, your choice). Life is after all, to be lived – that means that you have to experience everything in equal parts whether it’s the high of being in love or the messy events leading to the breakup; your first paycheck with 4 figures before the period or the check wrapped in a pink slip. Today’s lows will be tomorrow’s memories, heck you will probably talk about them with a smile someday. I believe that it is done unto you as you believe. For example, if you believe that the world is a bad place, then your world probably is, or is surely about to become so. If you believe that things are “getting better all the time”, then your conditions will begin to improve and will continue to do so . On the other hand if you are the patron saint of gloom and doom, whining and complaining constantly to anyone who will stand still long enough to hear it – well then you know where that puts you. I believe that there’s a little God in all of us, which gives us the ability to formulate and create the life that we want to live. I believe that if we use this ability in a bad way , we will eventually reap what we sow. I believe that before you can receive a lot, you have to give a little. I believe that we’re doomed to repeat the mistakes of the past, until we learn our lesson. What do you believe? Do you believe that I am full of it? Once upon a time I worked for a Fortune 500 company and was very unhappy. You see I was a dedicated worker who put in many hours and got the job done, but all anyone seemed to care about was my attitude! Listen, I’m West Indian, we are born with attitude, we don’t sugarcoat things – not because we don’t know how to, but because we don’t know why we should lie when the truth is as plain as my very broad nose. I live in the South and at the time felt unloved and misunderstood by my coworkers and managers; I wanted to be successful in my corporate career because I didn’t know any better. So my sister gave me this book “The Four Agreements” by Don Miguel Ruiz and when I read it something clicked. I typed up the four agreements and pinned them to the wall of my cubicle where I could see them everyday. Did I become an overnight success? Did the CEO send me flowers? Did I get a big raise? No, but that wasn’t the point was it? The point was to feel good about myself and radiate that out to those around me. In this I was successful, because I was able to separate what was about me from what was about them – most of the time. If you are a network marketer or internet marketer or in direct sales, I believe that The Four Agreements should be a part of your life too. After all we attract what we are, and if you are a lying, cheating so and so, or are afraid to pick up the phone, or can’t bring yourself to approach anyone about your business because they might say “No”- well…. I think that, for the marketer, being impeccable with your word could also mean to not make outlandish promises or tell lies about your product, service or business opportunity. You know things like “make money in your sleep”? The last two agreements will be discussed in my next post. If you don’t already own this book, The Four Agreements: A Practical Guide to Personal Freedom, A Toltec Wisdom Book get it now and leave me a comment, let me know what you think! Does Phone Fear Leave You Cowering In a Corner? When working your home based business, do your hands tremble, like an alcoholic in delirium tremens, as you reach for the phone to make the first call of the day? Do you sweat in unmentionable places as you run through your prospecting spiel? Does every “No” or “Not Interested” bring you that much closer to just throwing in the towel on network marketing? There’s a cure for that you know, and it doesn’t involve giving up on yourself or your dream of earning a full-time income from home. Have you ever heard “You’re too attached to the outcome” and wondered what the heck you should be attached to if not the outcome, or at least wondered what your upline was trying to tell you? Well thank goodness you found this post, because I am going to explain to you exactly what that means and how to get yourself detached and maybe even recruit some folks into your opportunity or sell some product. Do you think that you’re in this business to make money? If you believe in your heart that the purpose of your business is just to make money, then that right there, is your problem. 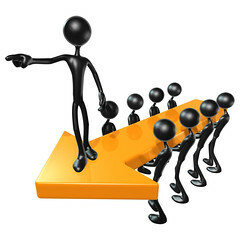 The outcome that you’re attached to is earning money by marketing this product or enrolling this new business partner. You are oozing scammer slime and your prospect hears you drooling down that phone line. Your special purpose ( as Steve Martin said in “The Jerk”) is to help people solve their problems – whether it’s a lack of money problem or a bad skin problem or a need to lose weight problem or a “my son is a teenager now and I want to spend time together before he heads off to college” problem. Your special purpose is not to be the solution to their problem, or make your solution fit their problem, it’s simply to figure out what that problem is. So lets practice, you’re still talking to George. You’ve already told him that you’re calling him back to give him that information that he requested about starting his own business (or working at home or whatever). Now George is going to try to get you to launch straight into your pitch, but you need to pace yourself, because first you need to find out what George is all about and what makes him tick (because when you close him on this call or a follow up call, you will need to be able to push those buttons). Sometimes you are able to determine fairly early on that you just do not have the solution to George’s problem, and that’s alright, that’s detachment. That’s exactly what not being attached to the outcome means; especially in network and affiliate marketing where you have got to be “OK” with not being the solution to everyone’s problem.